The motivation behind the paper was that while there are numerous studies comparing VGI to authoritative data in the developed world, there are very few that do so in developing world. In order to address this issue in the paper we compare the quality of authoritative road data (i.e. 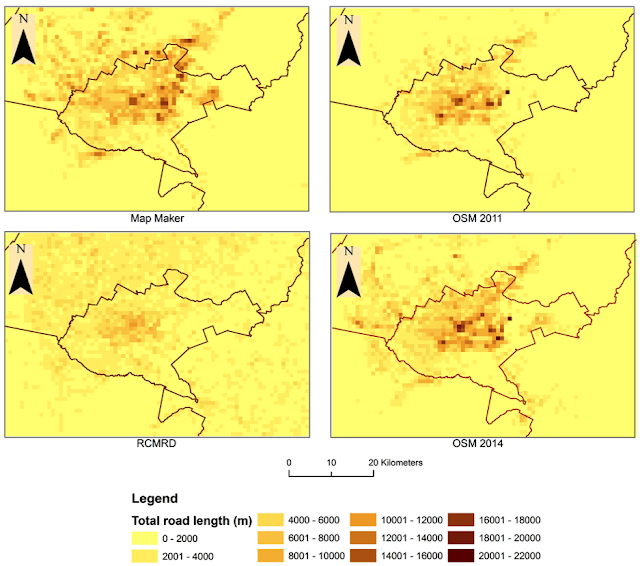 from the Regional Center for Mapping of Resources for Development - RCMRD) and non-authoritative crowdsourced road data (i.e. from OpenStreetMap (OSM) and Google’s Map Maker) in conjunction with population data in and around Nairobi, Kenya. Results from our analysis show variability in coverage between all these datasets. 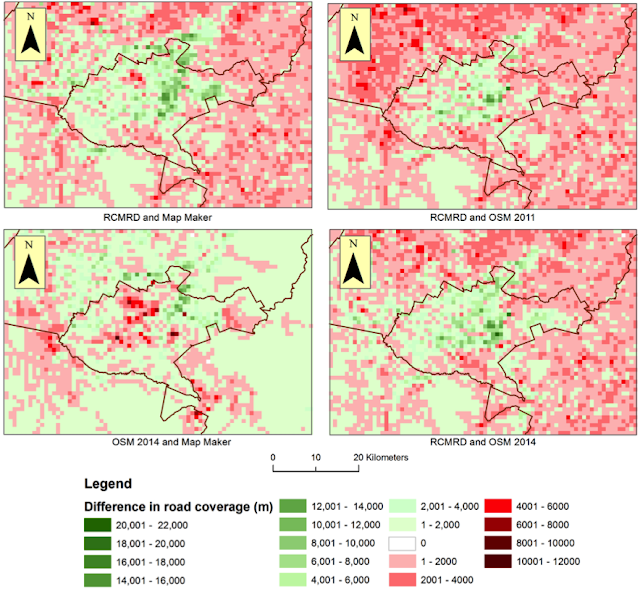 RCMRD provided the most complete, albeit less current, coverage when taking into account the entire study area, while OSM and Map Maker showed a degradation of coverage as one moves from central Nairobi towards more rural areas. Further information including the abstract to our paper, some figures and full reference is given below. With volunteered geographic information (VGI) platforms such as OpenStreetMap (OSM) becoming increasingly popular, we are faced with the challenge of assessing the quality of their content, in order to better understand its place relative to the authoritative content of more traditional sources. Until now, studies have focused primarily on developed countries, showing that VGI content can match or even surpass the quality of authoritative sources, with very few studies in developing countries. In this paper we compare the quality of authoritative (data from the Regional Center for Mapping of Resources for Development - RCMRD) and non-authoritative (data from OSM and Google’s Map Maker) road data in conjunction with population data in and around Nairobi, Kenya. Results show variability in coverage between all these datasets. 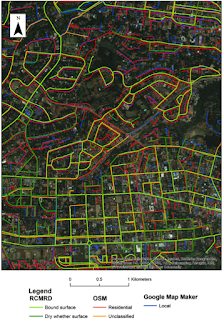 RCMRD provided the most complete, albeit less current, coverage when taking into account the entire study area, while OSM and Map Maker showed a degradation of coverage as one moves from central Nairobi towards rural areas. Furthermore, OSM had higher content density in large slums, surpassing the authoritative datasets at these locations, while Map Maker showed better coverage in rural housing areas. These results suggest a greater need for a more inclusive approach using VGI to supplement gaps in authoritative data in developing nations. Pairwise difference in road coverage. Clockwise from top left: i) RCMRD 2011 versus Map Maker 2014; ii) RCMRD 2011 versus OSM 2011; iii) RCMRD 2011 versus OSM 2014; iv) OSM 2014 versus Map Maker 2014 (Red cells: first layer has higher coverage; Green cells: second layer has higher coverage). Mahabir, R., Stefanidis, A., Croitoru, A., Crooks, A.T. and Agouris, P. (2017), “Authoritative and Volunteered Geographical Information in a Developing Country: A Comparative Case Study of Road Datasets in Nairobi, Kenya”, ISPRS International Journal of Geo-Information, 6(1): 24, doi:10.3390/ijgi6010024. As always any thoughts or comments about this work are welcome. 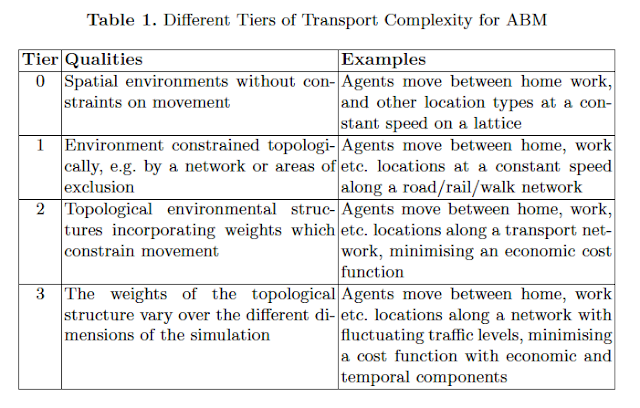 Sarah Wise, Mike Batty and myself have recently had a chapter published in Agent Based Modelling of Urban Systems entitled "Transportation in Agent-Based Urban Modelling". 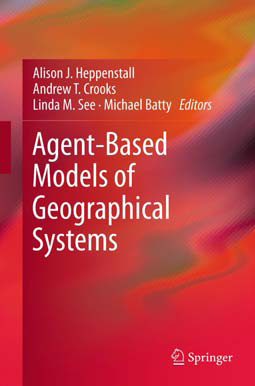 In the chapter we provide a critique in how transportation has been included or omitted from agent-based models and suggest how it might be handled in future applications. Our argument is that transportation plays an important role in nearly every aspect of our daily lives. However, within agent-based models that explore urban problems, transportation is often omitted. Using representative case studies (e.g. 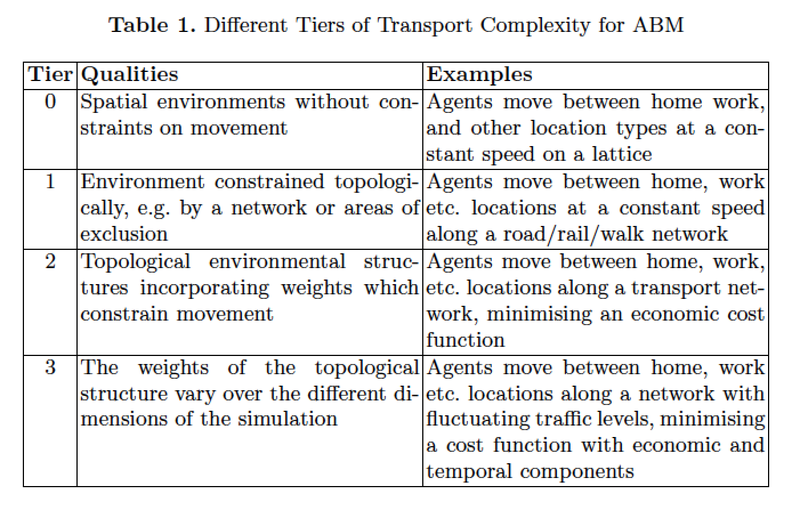 from crime, disease spread, and land use) we present different levels/tiers of complexity at which transportation systems are captured with agent-based models (as shown in Table 1). Table 2 shows how these tiers of complexity are captured within crime models. For interested readers, below you can see the abstract to our chapter. As the urban population rapidly increases to the point where most of us will be living in cities by the end of this century, the need to better understand urban areas grows ever more urgent. Urban simulation modelling as a field has developed in response to this need, utilizing developing technologies to explore the complex inter-dependencies, feedback's, and heterogeneities which characterize and drive processes that link the functions of urban areas to their form. As these models grow more nuanced and powerful, it is important to consider the role of transportation within them. 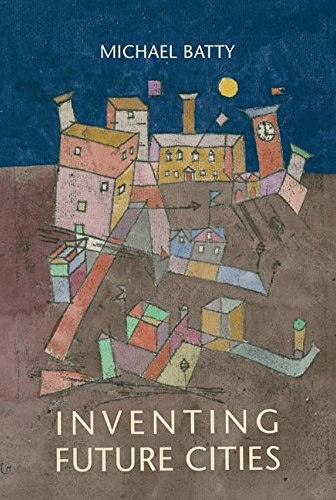 Transportation joins, divides, and structures urban areas, providing a functional definition of the geometry and the economic costs that determine urban processes accordingly. However, it has proved challenging to factor transportation into agent-based models (ABM); past approaches to such modelling have struggled to incorporate information about accessibility, demographics, or time costs in a significant way. 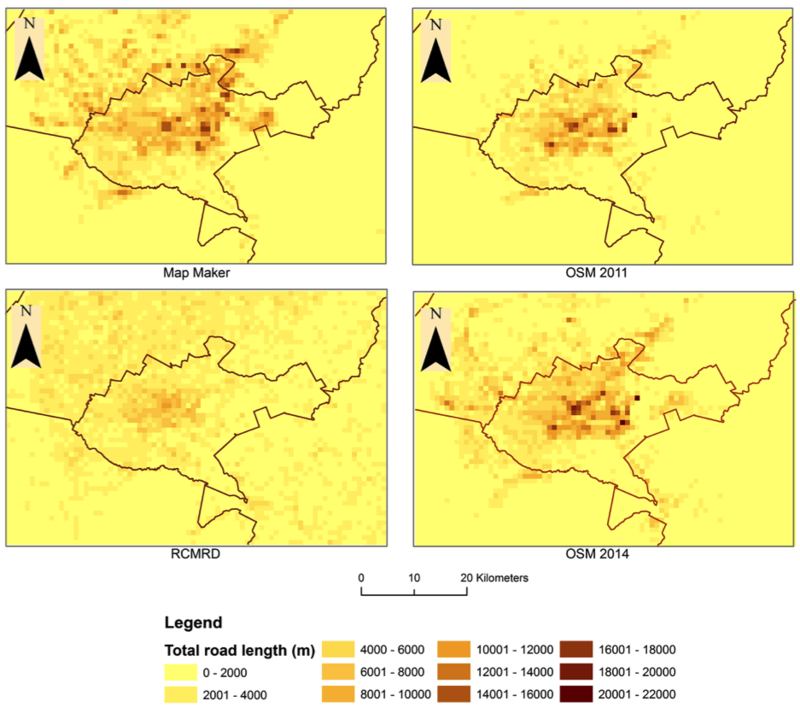 ABM have not yet embraced alternative traditions such as that in land use transportation modelling that build on spatial interaction in terms of transport directly, nor have these alternate approaches been disaggregated to the level at which populations are represented as relatively autonomous agents. Where disaggregation of aggregate transport has taken place, it has led to econometric models of individual choice or microsimulaton models of household activity patterns which only superficially embody the key principles of ABM. But the explosion in the availability of movement data in recent years, combined with improvements in modelling technology, is easing this process dramatically. In particular, agent-based modelling as a methodology has grown ever more promising and is now capable of emulating the interplay of urban systems and transportation. Here, we explore the importance of this approach, review how transportation has been factored into or omitted from agent-based models of urban areas, and suggest how it might be handled in future applications. Our approach is to take snapshots of different applications and use these to illustrate how transportation is handled in such models. The ABMUS2017 workshop on Agent-based modelling of urban systems will be held at the AAMAS2017 conference in Sao Paulo, Brazil on 8-9 May 2017. It is the follow-up of ABMUS2016 held in Singapore during AAMAS2016 on the 10th of May 2016. Researchers and practitioners who use agent-based models and agent systems to understand, explore, and manage cities and urban infrastructure systems are invited to submit papers to ABMUS2017. The overarching theme for the workshop is data for agent-based models. Data is essential for building, calibrating, and validating agent-based city and urban infrastructure models. But which approaches are optimal for what purposes? We invite presentations that describe data collection and data management approaches in agent-based models, as well as the use of data sets and methodologies that can be translated and re-used between researchers, sectors and countries. 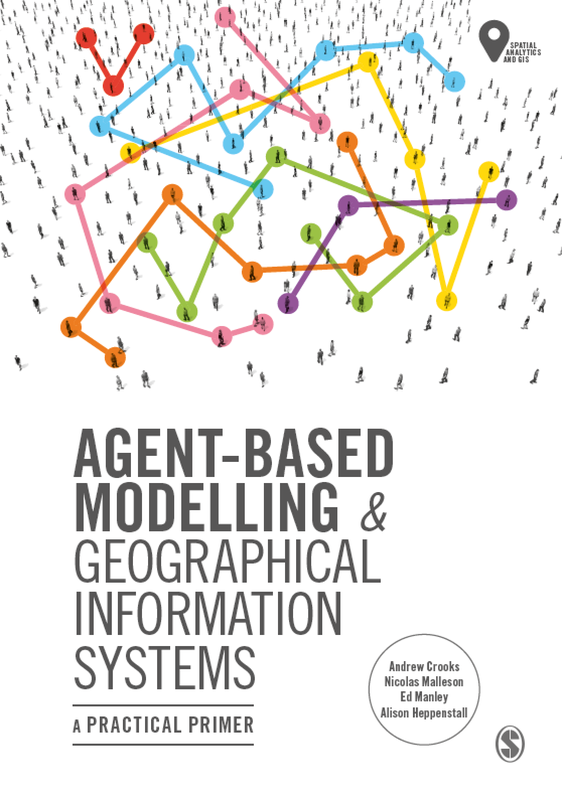 Agent-based modelling of urban transport, land-use, housing, energy, health, etc. At the workshop each presenter will be given 10 minutes to introduce their paper and/or case study, followed by 5-10 minutes in which presenters will share their views on the data for agent-based models theme. After three presentations there will be 20-30 minutes of group discussion in which presenters will act as panel members.